I've been threatening this one for a bit. How do you fancy this? 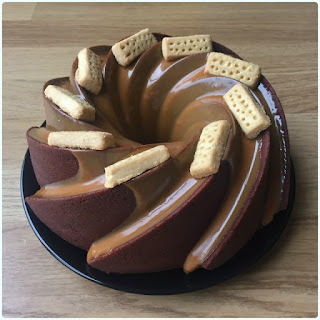 Ultra moist chocolate cake, flavoured with actual shortbread, and doused in caramel. I don't even like chocolate cake that much, but this one is pretty good. 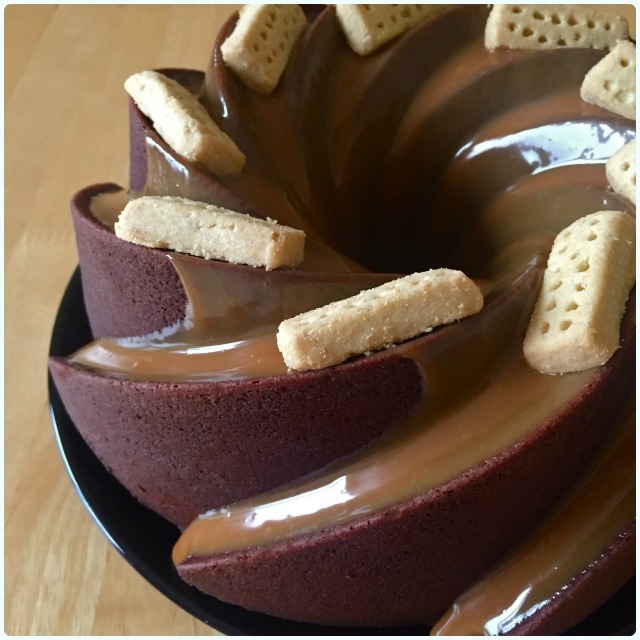 Prepare a regular sized bundt tin - 2.4l, 10 cup, 10 inch with Cake Release spray/melted butter and dust with flour. In a separate bowl, measure out the flour, cocoa, bicarbonate of soda and salt. Pour the yoghurt, chocolate milk and chocolate caramel spread into a jug. Sift in a third of the flour mix followed by half the yoghurt mix. Repeat this until everything is combined. Stir in the crushed shortbread. When the cake is fully cool, pop the Carnation Caramel into a jug and heat in the microwave to loosen it. Tip over your cake and decorate with more shortbread!